LIMA -- A suspected Shining Path guerrilla leader was captured by army troops during an operation in Aucayacu, a town in Peru's central Huanuco region, the armed forces joint command said. Alejo Teodosio Maylle Tolentino, who was carrying documents and other materials linked to the guerrilla group, was captured on Saturday. Maylle, known as "Comrade Rocky," is suspected of being the second-in-command of a rebel unit that operates in the Alto Huallaga Valley, where Aucayacu is located, taking his orders from "Comrade Artemio," the only remaining high-profile fugitive of the Shining Path. 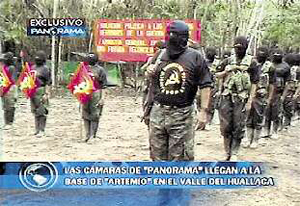 The so-called "remnants" of the Shining Path operate in the Alto Huallaga under the command of Comrade Artemio and in the Valley of the Apurimac and Ene rivers, or VRAE region, under the command of "Comrade Jose" and "Comrade Alipio," who some officials contend have allied themselves with drug traffickers. Some analysts say the guerrilla group, which terrorized Peru in the 1980s, has transformed itself into a drug cartel. Maylle's capture came a day after the government relieved the police chief in the VRAE, Percy Rivera Paiva, of command for negligence. Rivera Paiva sent about 100 arms and thousands of rounds of ammunition to the VRAE in an unguarded bus, officials said. 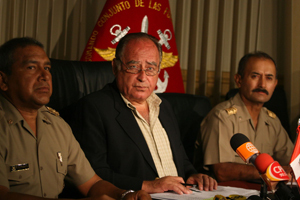 On Tuesday, Shining Path guerrillas fired two rocket-propelled grenades at the helicopter carrying armed forces chief Gen. Francisco Contreras in Vizcatan, but no one was injured in the attack, Defense Minister Antero Flores Araoz said. The attack on the helicopter was reported Wednesday by the Peru.21 newspaper, whose reporter was aboard the aircraft, which was carrying several high-ranking officers. Since August, the armed forces have been making an aggressive push in the VRAE region in an effort to gain control of Vizcatan, considered the last bastion of the Shining Path. The Shining Path has responded by increasing its activities in Vizcatan in recent months. Two weeks ago, the Shining Path claimed responsibility for two ambushes near the town of Sanabamba in which 14 soldiers died. The ambushes staged on April 9 were some of the deadliest attacks launched in recent months by the Shining Path. Last October, the guerrillas killed 15 people, including 13 soldiers, in a remote coca-growing region in the Andean province of Huancavelica. The Shining Path and its role in drug trafficking have been blamed for a rise in violence in the interior of Peru. 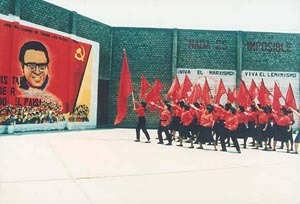 The Maoist-inspired group launched its uprising on May 17, 1980, with an attack on Chuschi, a small town in Ayacucho province. A truth commission appointed by former President Alejandro Toledo blamed the Shining Path for most of the nearly 70,000 deaths the panel ascribed to politically motivated violence during the two decades following the group's 1980 uprising. The guerrilla group also caused an estimated $25 billion in economic losses, according to commission estimates. Founder and leader Abimael Guzman, known to his fanatic followers as "President Gonzalo," was captured with his top lieutenants on Sept. 12, 1992, an event that signified the "defeat" of the insurgency. Since then, isolated guerrilla bands have engaged in sporadic and largely ineffective activity in a few regions.